The average cost of memory care in Cuyahoga County is $4,620 per month. This is lower than the national median of $4,650. To help you with your search, browse the 36 reviews below for memory care facilities in Cuyahoga County. On average, consumers rate memory care in Cuyahoga County 4.1 out of 5 stars. Better rated regions include Geauga County with an average rating of 5.0 out of 5 stars. Caring.com has helped 14 families in Cuyahoga County find high-quality senior care. To speak with one of our Family Advisors about memory care options and costs in Cuyahoga County, call (855) 863-8283. Cuyahoga County is home to almost 220,000 people aged 65 and over, and it's likely that some of those people might be among the estimated 200,000 people in Ohio that are currently living with Alzheimer's disease. Seniors living in Cuyahoga County have access to 30 memory care facilities that specialize in care for people with cognitive impairments. 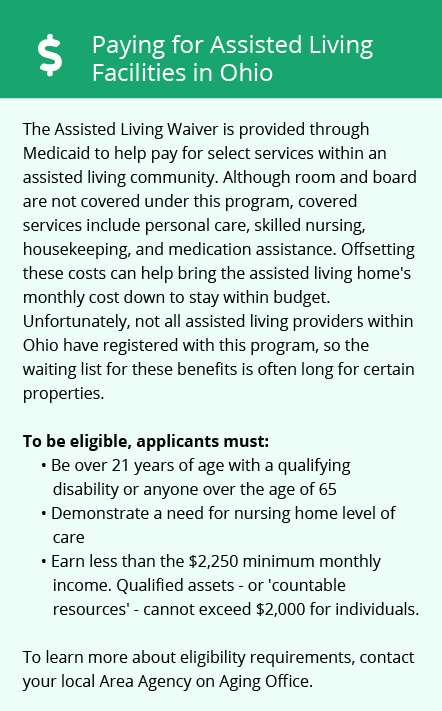 These facilities are referred to as Residential Care Facilities in Ohio and are required to provide a safe environment for their residing seniors. Cuyahoga County is home to world-class medical facilities, including those specializing in brain health and dementia care such as MetroHealth Medical Center, in the event of medical emergencies or illness. The air quality in Cuyahoga County could present a problem for seniors with respiratory problems. The American Lung Association awarded a rating of "F" in its ozone category, and a "fail" in the annual particle pollution category. While it's typical for highly populated and industrialized areas to receive low ratings, these ratings are notably poor. Cuyahoga County can be an affordable place to live for seniors on a budget. An overall cost of living that's more than ten percent lower than the national average, and healthcare bills almost 20 percent lower, means more money could be allocated to paying for a memory care facility. An average of 70 inches of snow a year in Cuyahoga County is almost three times the national average of 26 inches annually. Because of this, winters are often extremely cold. It could be a good idea to inquire about the steps that facilities take to ensure residents don't manage to get outside in such a chilly climate. Memory Care costs in Cuyahoga County start around $4,620 per month on average, while the nationwide average cost of memory care is $4,800 per month. It’s important to note that memory care rates in Cuyahoga County and the surrounding suburbs can vary widely based on factors such as location, the level of care needed, apartment size and the types of amenities offered at each community. 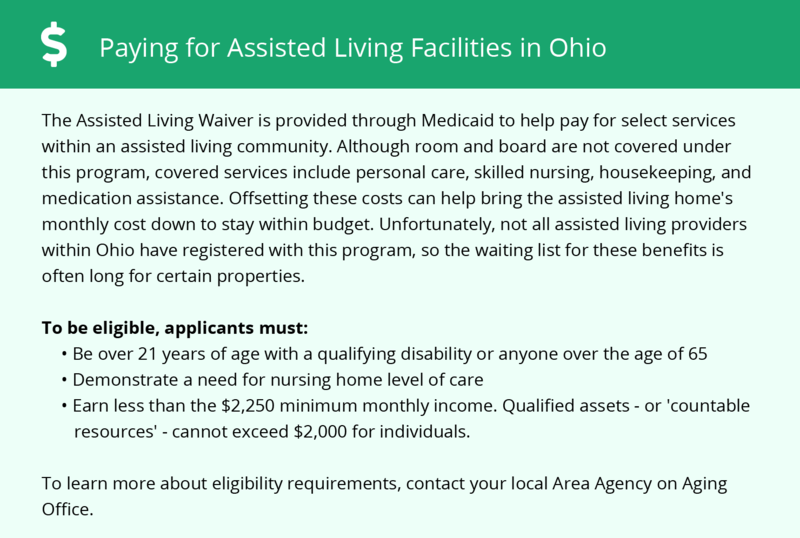 Cuyahoga County and the surrounding area are home to numerous government agencies and non-profit organizations offering help for seniors searching for or currently residing in an assisted living community. These organizations can also provide assistance in a number of other eldercare services such as geriatric care management, elder law advice, estate planning, finding home care and health and wellness programs. To see a list of free memory care resources in Cuyahoga County, please visit our Assisted Living in Ohio page. Cuyahoga County-area assisted living communities must adhere to the comprehensive set of state laws and regulations that all assisted living communities in Ohio are required to follow. Visit our Memory Care in Ohio page for more information about these laws.